R.L. Akers' conflicted detective Gray Gaynes comes full circle in book 6 of the mystery series that bears his name... and the truth finally comes out. Following the bombshell revelations of the re-opened Mad Batter investigation, NYPD detective Gray Gaynes finally has a killer in custody — and the proof he needs to secure a conviction. But the truth is worse than he imagined, for there was more than one killer... and the second killer, still at large, was the very one who murdered Gaynes' own wife. Unfortunately, Gray is now suspended, his badge and gun confiscated following the exposure of his debilitating neurological conditions. He has no authority to continue his investigation, but neither can he let it go. As one friend after another shuns the disgraced detective, his life will spiral out of control until he's left with nothing but a quest for vengeance. And once he reaches the end of his hunt, he will face the most devastating revelation of all... that nothing he believed about this last year was true. Meet Gray Gaynes: a brilliant investigator, but also a man deeply wounded by his own personal tragedy... A man who can no longer hide the irrevocable changes he is undergoing. 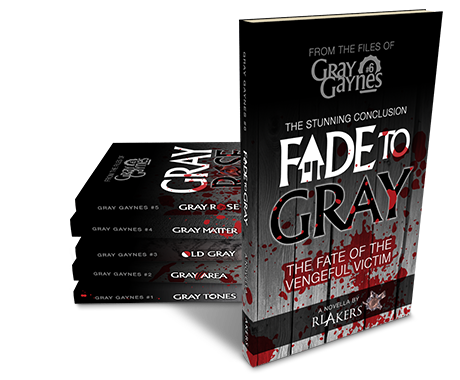 Fade to Gray is on sale now, along with Gray's previous mysteries. 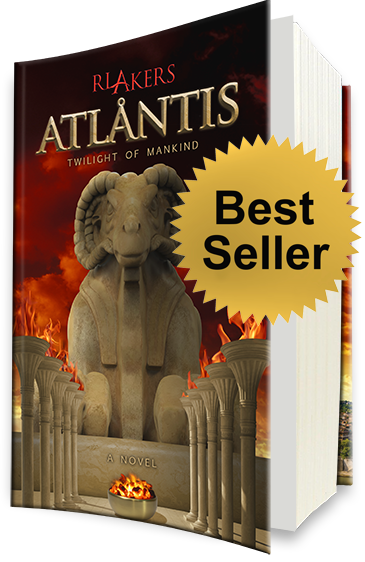 In a time before recorded history, most of humankind lives in close proximity to a single magnificent City located on the Isle of Atalas. Ruled directly by a Pantholon of twenty-three gods, society remains in a pre-industrialized state, but great strides have been made in the realms of engineering and genetics. In pursuit of absolute power, one of the four ruling members of the Pantholon sends his demigod son D'Akaio on a series of missions designed to undermine his rivals; as D'Akaio's fame grows among the common people, so too do the stories told about him (eventually becoming the very legends that informed Norse, Egyptian, and Greco-Roman mythology). Meanwhile, D'Akaio's half-sister Adana launches her own private war against the Pantholon, working with an underground resistance movement to quietly rescue the women and children who are scheduled for sacrifice before the gods. Events build toward a confrontation between brother and sister, even as the City and its depraved society speed toward prophesied doom. R.L. Akers' GRYPHENS Saga tells that tale. Blending military thriller and science fiction – with an emphasis on the science – new author R.L. Akers produces a well-crafted story peopled by characters you'll grow to love and hate. When the threat from outer space becomes known, the U.S. government is caught unprepared. With time running out, the military must adapt to an entirely new variety of warfare. Pilots and soldiers must be recruited, trained, and deployed to defensive installations in orbit above North America, and technology must take a giant leap forward – with considerable assistance from a surprising source. From the shadows of rural England to the bowels of Area 51's Groom Lake installation, from the most remote corner of our planet to geosynchronous orbit thousands of miles above, the Gryphens Saga comprises a single well-researched and believable story about humanity's real-world response to the threat of alien invasion. You won't want to put these books down! R.L. Akers loves stories. He loves hearing them, loves telling them, loves embellishing them, and loves forging them from raw materials. He is convinced that every person who ever lived has an interesting story, and he's only met one person in his life who came close to proving otherwise. 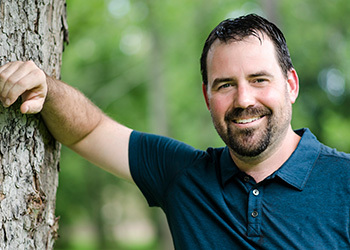 Holder of an undergraduate degree in computer science and a master's degree in business administration, Akers has worked in software development as well as non-profit fundraising and publicity. His love for children has led him in the past to be a foster parent and a coordinator of the K-5 ministry at his church. His interests include graphic design, orchestral movie soundtracks, and anything remotely creative. Prometheus Rebound and Prometheus Revealed were his first published novels. 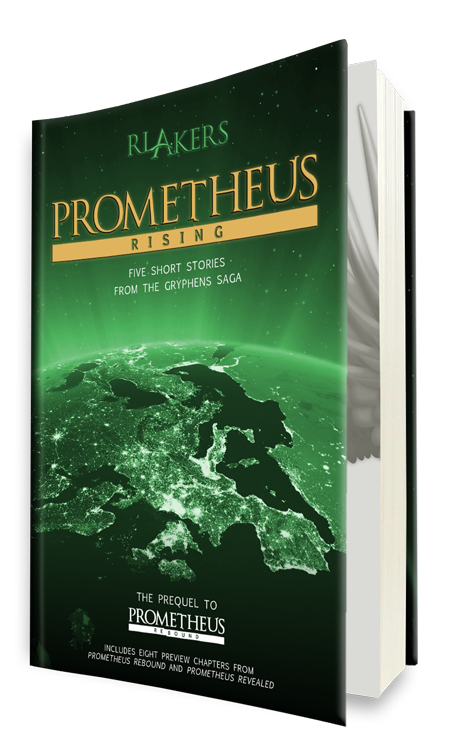 He has also released Prometheus Rising, a collection of short story prequels set within the same universe. 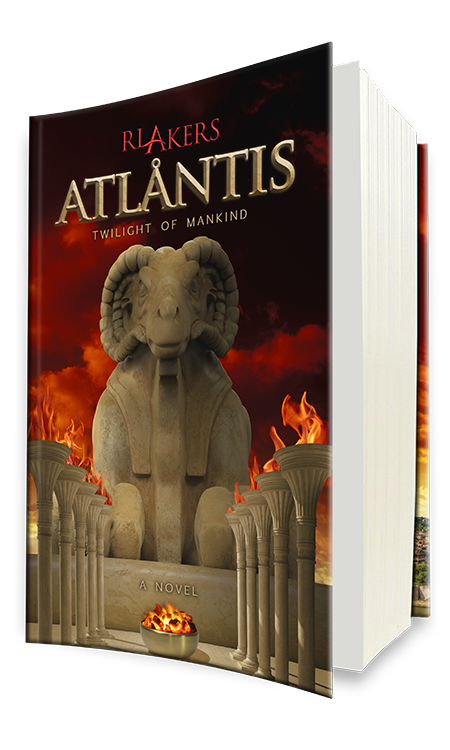 More recently, Akers tackled the legend of Atlantis, after which he will resume work on an epic high fantasy trilogy and a series of short stories featuring an NYPD detective with an unusual problem. Akers lives in West Virginia with his wife Sarah and the four children he loves most in this world. Click any of the preview boxes below to access the full review. "An audacious storyline... More than a few bombshell plot twists..."
"Everything about this novel is polished to a shine, particularly the tightly plotted narrative." "Powered by a courageous and endearing heroine at world's end, like Ender's Game for the 21st century." "This impressive debut novel—the first installment of the Gryphens duology—is a highly palatable blend of alien invasion thriller, apocalyptic fiction and military sci-fi." "Rising sci-fi author R. L. Akers spins a story that appears more real than fiction." "Akers keeps his storyline constantly fluid by alternating between character scenes filled with everything military (both good and bad), back stories, and subplots that are laced with a bit of romance and comedy amid alien attacks and mysterious figures bent on sabotage." 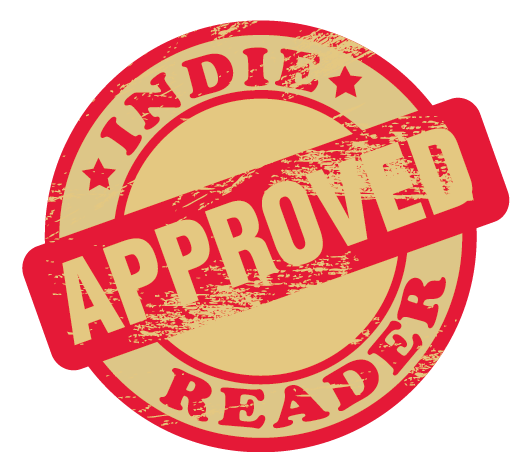 IR Verdict: "The first book in The Gryphens Duology, PROMETHEUS REBOUND is a fast paced tale of unsuspected twists and turns that is bound to be a favorite among sci-fi readers." "Akers' fast-paced science fiction thriller is far from boring. In fact, it is a vastly entertaining and engrossing read that is almost impossible to put down." "Deftly blending elements of the movie "Independence Day" with the pace of Tom Clancy and David Weber's scientific explanations of future technology, Akers has crafted a well-written tale of military science fiction that will keep readers begging for more." "The amount of actual scientific knowledge and data the book contains is amazing." "Very well structured, skillful dialog and plot building with amazing character development." "Any reader who enjoys science fiction or military genre type books won't be disappointed..."
The sun had been hinting at its impending arrival for perhaps an hour when it finally appeared over the mountains to the west. The fiery orb was magnificent in its splendor, instantly dispelling what predawn gloom remained in the small valley where the Setines made their encampment. Yefet gazed over the collection of ramshackle buildings and the flocks at pasture, now easily visible from his vantage at the opening to the mountain pass. But even in full light of day, there remained no sign that his wayward brother was even moving yet. He made a disgusted sound in the back of his throat. An hour of daylight already lost; how much longer would Chem delay them? H'phaest'm was something of an oddity among the gods. One of the Six, he nonetheless stood outside the normal power structure of the Pantholon. His unique talents were in demand by all of the others, and thus he had managed to carve out a niche for himself in City politics; he remained at the heart of things, without paying tribute to any one of the Four. He alone among the gods was indifferent to the worship of mortals. He was architect, inventor, creator — programmer, as he preferred to style himself. He exercised power in the form of direct control over nature. D'Akaio's first task took him to a farming community northwest of the City. It seemed the villagers there had been plagued for some time by a great lizard of particular ferocity; at intervals no man could predict, the beast would emerge from Lake Qual to swoop down upon men and oxen in the field, slaughtering the men and making off with the choicest oxen clamped in its huge jaws. ... A child rushed up then, one Adana knew, a boy just beginning to sprout whiskers. He was out of breath and couldn't speak at first — but from his expression, Adana knew immediately that something was terribly wrong. "What? What is it?" she demanded. "Fire," he finally managed to say. "Fire. At the Castle. Kids trapped." Adana paled. "Go! Take us there!" The room is stark, sterile. Row upon row of 4-inch white tiles cover each wall, stretching from floor to ceiling. The floor itself is waxed to a high shine. Medical machines line the periphery, beeping, whirring, blinking, and an analog clock reads 10:27. Everything is white. The patient perches at the center of the room. Stock-still, sitting on the very edge of the small bed, the patient stares at the floor... then explodes into motion. "Way too close," the ersatz cop agrees. More silence, until one of the EMTs growls, "How long is he gonna let this go on?" The cop can only shake his head. "He puts way too much faith in her ability to protect herself. Obviously." Prometheus Rebound: "By the Numbers"
"She's dropped off the grid. All our efforts to reacquire have failed." The man on the other end of the line blows out his breath disgustedly. "One of the other interested parties?" "Yessir, must be. She couldn't have disappeared so completely on her own." "But you don't know who took her?" "Her trail ends at the Vegas airport. Surely that means—"
"I don't pay you to make guesses, I pay you to surveil. You lost her." The monitors begin winking on around her as Kara settles into her acceleration couch for the training exercise. Each hand on the opposite wrist, she squeezes an activation switch for three seconds to initiate her VR gloves, then flips a switch on the integrated goggles. She leans back in her chair as the program's calibration routine launches. The control sphere materializes bright green in front of her, semi-transparent and a bit ghostly looking. Following the instructions of an ethereal female voice, she grasps the yoke with her right hand, spins it a few times in varying directions, then throws her arms out in a sequence of test maneuvers. Brigadier General Carl J. Grant's steady eyes hold hers for a long moment. When he speaks, he sounds exhausted. "Have you ever heard of Rendlesham Forest?" He sighs. "About thirty years ago—no, almost thirty-four years now—a spacecraft crash-landed in a forest in Suffolk, England. An honest-to-goodness unidentified flying object. Between the heightening tensions of the Cold War and the growing number of UFO claims worldwide, the Air Force had dedicated immense resources to investigating any reports of airborne phenomena. I was team leader for one of several commando units that would respond to these reports—and it was my team that was assigned this one." Lt. Carl J. Grant was a quarter way through a bottle of scotch when the call came—the call that would change his life and set into motion more than three decades of military and political intrigue. Setting his glass back down on the table, Grant poured another three fingers, then took up the glass again—all one handed. His other hand stayed wrapped around his service pistol, a Browning HP. The annoying ringing finally stopped. Gladys DeMaria closes the front door behind the two visitors, turns the deadbolt quietly—there's no need to be rude, after all—and leans momentarily against the door. She looks up the staircase, wondering how long it will take Donald to offer an explanation if left to his own devices. He doesn't get many visitors, and Gladys wonders what the woman and the man in uniform wanted with him. She heaves a sigh and starts up the stairs, her knees creaking slightly. Best not to leave Donald to his own devices when it comes to communication. She knocks lightly on the door. "Donald, dear?" Briefly lifting up his helmet visor's VR overlay, Lt. Trey Drogosch of the Orbital Defense Corps squeezes his eyes shut, wishing he could rub at them with his hand, the old fashioned way. He blinks a few times in the pitch dark, then pulls the overlay back down and watches the virtual displays reappear. He's barely into the second hour of his shift, but he's already having problems staying awake. He missed his morning coffee, and now that he's trapped inside his vac suit inside a Destrier for another six and a half hours, there's little he can do about it. This week will see the release of the third installment of the Hunger Games movies, which feature strong female protagonist Katniss Everdeen leading the fight against a corrupt government. R.L. Akers feels that casting an empowered young woman as the lead character opens up a number of great opportunities from a storytelling perspective. "Right or wrong, our society has traditionally been patriarchal, and as a result, it's easy to fit a female protagonist into an underdog role—and audiences love underdogs." R.L. Akers' new novel Prometheus Rebound tells of an alien threat that results in the creation of a new branch of U.S. military: the Orbital Defense Corps. Leading the fight—and this new branch of military—will be Kara Dunn, a young woman with no idea of the destiny she alone can fulfill. Akers shares that he had a great deal of fun writing Kara Dunn, because "she's a strong person who nevertheless deals with insecurity and doubt, all while making her way in a male-dominated arena. To the people around her, she truly is a staunch individual—but as the reader, you have the benefit of seeing inside her mind and identifying with all of the hopes and fears that she never shows to anyone else." In Prometheus Rebound, R.L. Akers introduces a diverse cast of characters who band together from all walks of life to face the alien threat. Blending military thriller and science fiction (with an emphasis on the science), Akers produces a tale that is truly epic in scope. When the threat from outer space becomes known, the U.S. government is caught unprepared, and the military must adapt to an entirely new variety of warfare in just a few short months. Pilots and soldiers must be recruited, trained, and deployed to defensive installations in orbit above North America, and technology must take a giant leap forward as a new branch of U.S. military comes into being. R.L. Akers has created an immersive story which takes place in our very own real world—alien crash landings in the shadows of rural England, secretive meetings in the bowels of Area 51's Groom Lake installation, clandestine spacecraft launches from undisclosed mobile facilities in the middle of the ocean, and vast space battles waged in orbit above. Prometheus Rebound and its sequel Prometheus Revealed comprise a single well-researched and believable story about humanity's real-world response to the threat of alien invasion—and readers can enhance their enjoyment of this story with Hollywood-style cinematic trailers, press kits, an interactive Orbital Defense Corps website, and even an ODC hotline. Will Hollywood Get it Right for Once? Will Interstellar Portray a More Realistic Story of Our Future Among The Stars? Sci-fi Author R.L. Akers discusses why Science is a Vital Component in Science Fiction. This Friday, science fiction fans will be lining up to see Interstellar, the new Christopher Nolan movie about a group of astronauts who travel through a black hole in search of a new home for humanity. R.L. 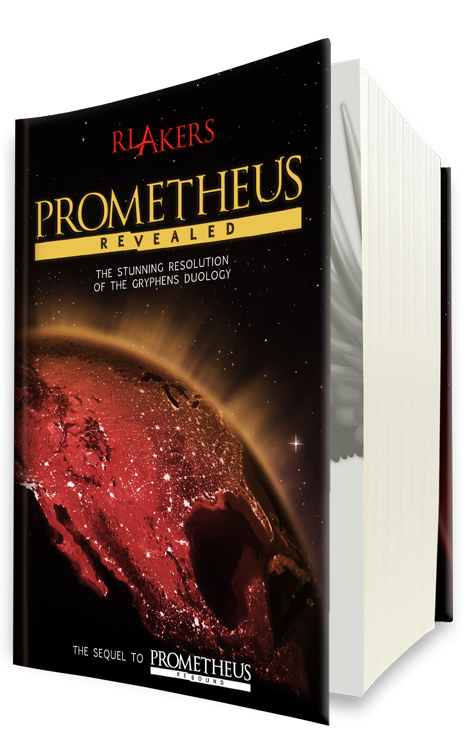 Akers—author of Prometheus Rebound—says, "Too often, Hollywood throws science out the window when making movies. I'm thrilled to see that Nolan's team worked closely with theoretical physicist Kip Thorne to make sure Interstellar is not only a great story but a plausible one as well." Why science should be a vital component in science fiction. Some common misconceptions Hollywood has perpetuated in our favorite movies. Why the human story is ultimately more important than science or stunning visuals. In Prometheus Rebound, R.L. Akers relates a gripping human story rooted in scientific reality. Blending military thriller and science fiction, Akers produces an epic tale full of characters whom readers will grow to love. When the threat from outer space becomes known, the U.S. government is caught unprepared, and the military must adapt to an entirely new variety of warfare in just a few short months. Pilots and soldiers must be recruited, trained, and deployed to defensive installations in orbit above North America, and technology must take a giant leap forward as a new branch of U.S. military comes into being: the Orbital Defense Corps. R.L. Akers has created an immersive story which takes place in our very own real world – alien crash landings in the shadows of rural England, secretive meetings in the bowels of Area 51's Groom Lake installation, clandestine spacecraft launches from undisclosed mobile facilities in the middle of the ocean, and vast space battles waged in orbit above. Prometheus Rebound and its sequel Prometheus Revealed comprise a single well-researched and believable story about humanity's real-world response to the threat of alien invasion – and readers can enhance their enjoyment of this story with Hollywood-style cinematic trailers, press kits, an interactive Orbital Defense Corps website, and even an ODC hotline. Great Halloween Topic: 76 Years Ago, the World Thought it was under Alien Attack during "War of the Worlds"
October 30th marks the 76th anniversary of the scariest and most remembered radio drama of all time, "War of the Worlds." Orson Welles and his cast were so convincing that thousands of citizens panicked, flooding police switchboards with calls, boarding themselves in their homes, and – in an extreme case – taking rifle shots at a New Jersey water tower, believing it to be an invading alien craft. 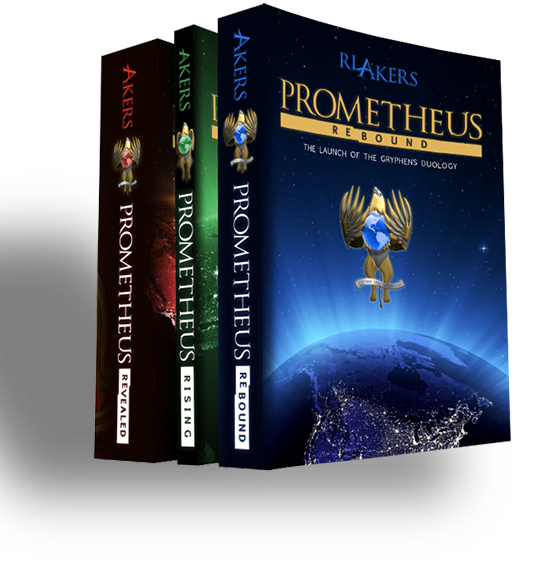 Prometheus Rebound sci-fi author R.L. Akers says that tales of alien attacks are still fun and relatable. "For decades now, our culture has been unable to escape its love affair with science fiction. Stories like Independence Day, the Day the Earth Stood Still, and War of the Worlds entertain us again and again (often through remakes) because we both love and fear the unknown." In Prometheus Rebound, R.L. Akers puts his own fresh twist on this time-honored formula. Blending military thriller and science fiction (with an emphasis on the science), Akers produces an epic tale full of characters whom readers will grow to love. When the threat from outer space becomes known, the U.S. government is caught unprepared, and the military must adapt to an entirely new variety of warfare in just a few short months. Pilots and soldiers must be recruited, trained, and deployed to defensive installations in orbit above North America, and technology must take a giant leap forward as a new branch of U.S. military comes into being: the Orbital Defense Corps. Much like 76 years ago, if someone stumbled upon R.L. Akers' website or toll-free hotline, they might believe the world really was in a fight for survival against alien attackers. 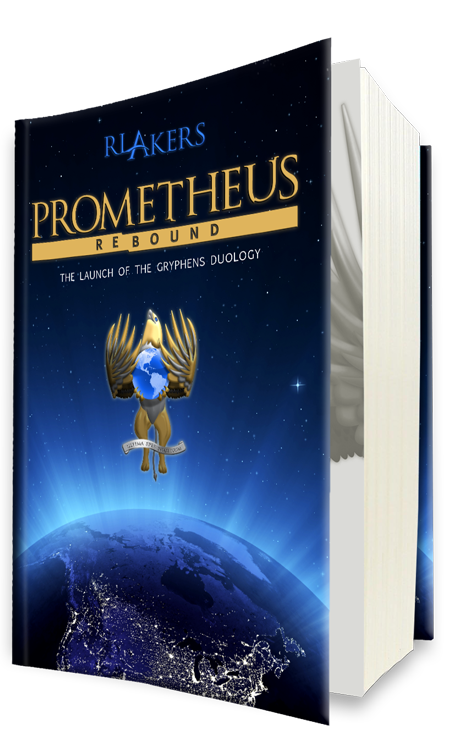 CHARLESTON, WV – Prometheus Rebound goes on sale today (11/8), the first novel by author R.L. Akers. The book is available from Amazon.com in softcover and Kindle editions; there will also be a book release party at Southridge Chick-fil-A tomorrow (11/9), where the book will be sold at discount, and the author will be on hand to sign and personalize purchased copies. Akers also be available during that time for media interviews.